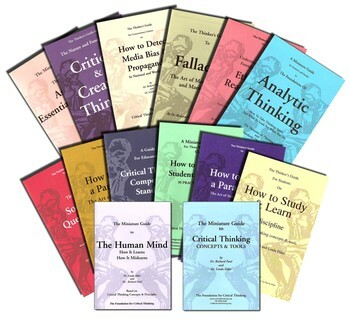 The Thinker’s Guides are small pamphlets from the Foundation for Critical Thinking that focus on critical thinking strategies in skills disciplines. The Miniature Guide to Critical Thinking is excellent for providing a condensed overview of thinking and is a handy reference for both student and teacher. 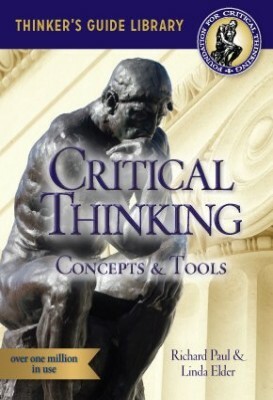 For an introduction to critical thinking that is suitable for junior high and high school. The Aspiring Thinker’s Guide to Critical Thinking provides clear definitions and questions that lead to a fundamental understanding of critical thinking. In addition, it is well laid out, with images and print that appeal to learners today. Elder, Linda and Richard Paul. A Miniature Guide for Those Who Teach On How to Improve Student Learning: 30 Practical Ideas. Foundation for Critical Thinking Press, 2007. Print. Elder, Linda and Richard Paul. The Miniature Guide to Taking Charge of the Human Mind: Thinking, Feeling, Wanting. Foundation for Critical Thinking Press, 2007. Print. Hawkins, David, Linda Elder and Richard Paul. The Thinker’s Guide to How to Clinical Reasoning. Foundation for Critical Thinking Press, 2007. Print. Hiler, Wesley and Richard Paul. The Miniature Guide to Practical Ways for Promoting Active and Cooperative Learning. Foundation for Critical Thinking Press, 2006. Print. Paul, Richard and Linda Elder. A Critical Thinker’s Guide to Educational Fads. Foundation for Critical Thinking Press, 2007. Print. Paul, Richard and Linda Elder. A Glossary of Critical Thinking Terms and Concepts. Foundation for Critical Thinking Press, 2009. Print. Paul, Richard and Linda Elder. A Guide for Educators to Critical Thinking Competency Standards: Standards, Principles, Performance Indicators, and Outcomes with a Critical Thinking Master Rubric. Foundation for Critical Thinking Press, 2007. Print. Paul, Richard and Linda Elder. The Miniature Guide to Critical Thinking: Concepts and Tools, 3rd Ed. Foundation for Critical Thinking, 2008. Print. Paul, Richard and Linda Elder. The Thinker’s Guide for Conscientious Citizens on How to Detect Media Bias & Propaganda in National and World News. Foundation for Critical Thinking Press, 2008. Print. Paul, Richard and Linda Elder. The Thinker’s Guide for Students and Faculty to Scientific Thinking. Foundation for Critical Thinking Press, 2008. Print. Paul, Richard and Linda Elder. The Thinker’s Guide for Students on How to Study & Learn. Foundation for Critical Thinking Press, 2007. Print. Paul, Richard and Linda Elder. The Thinker’s Guide to Analytic Thinking. Foundation for Critical Thinking, 2007. Print. Paul, Richard and Linda Elder. The Thinker’s Guide to Fallacies: The Art of Mental Trickery and Manipulation. Foundation for Critical Thinking, 2006. Print. Paul, Richard and Linda Elder. The Thinker’s Guide to How to Read a Paragraph: The Art of Close Reading. Foundation for Critical Thinking Press, 2008. Print. Paul, Richard and Linda Elder. The Thinker’s Guide to How to Write a Paragraph: The Art of Substantive Writing. Foundation for Critical Thinking Press, 2007. Print. Paul, Richard and Linda Elder. The Thinker’s Guide to Intellectual Standards: The Words That Name Them and the Criteria That Define Them. Foundation for Critical Thinking Press, 2008. Print. Paul, Richard and Linda Elder. The Thinker’s Guide to the Art of Asking Essential Questions. Foundation for Critical Thinking Press, 2009. Print. Paul, Richard and Linda Elder. The Thinker’s Guide to the Art of Socratic Questioning. Foundation for Critical Thinking Press, 2007. Print. Paul, Richard and Linda Elder. The Thinker’s Guide to the Nature and Functions of Critical & Creative Thinking. Foundation for Critical Thinking Press, 2008. Print. Paul, Richard and Linda Elder. The Thinker’s Guide to Understanding the Foundations of Ethical Reasoning, 3rd Ed. Foundation for Critical Thinking Press, 2009. Print. Paul, Richard, Robert Niewoehner and Linda Elder. The Thinker’s Guide to Engineering Reasoning. Foundation for Critical Thinking Press, 2007. Print.